Under the scorching sun of the Grand Canyon, there’s a battle between two armed bandits and a cowboy. A sack of coins was robbed, and the latter has for mission to find the treasure. Come along the 5 reels and 30 paylines video slot machine of Sticky Bandits Slot and spin its reels for some potential huge wins. This online slot machine is playable on all devices: iOS and Android devices. Create an account on Wicked Jackpots and enjoy this Quick Spin creation. Are you in the quest for some thrilling spinning adventure into the virtual Grand Canyon? On this wild west inspired slot machine, you will find an array of western themed symbols like the following playing cards: A, K, Q and J. You will also find sacks loaded with golden coins, two heavily armed guys, a cowboy, a blond woman and dynamite sticks. The blond female bandit is the most lucrative symbol and it can bestow you with 200 coins if you get 5 of them on a win line. Bet Levels: Hey, you! Do you know the different Bet Levels? On Sticky Bandits Slot there are none! Amount of Paylines Selection: But when it comes to the paylines, you will find 30 of them and they all remain fixed. Coin Values: No, no coin values! Only the Total Bet that ranges from 0.15 to 90.00. On Sticky Bandits Slot, the massive wild symbols are represented by two armed bandits. And guess, what! They both act as the wild symbol as well as the bonus symbol. They can substitute for every symbol on the reels. The Massive Wild symbols consist of 2 wide reels and they can take over 2 entire reels. The bonus symbol is represented by the train and it can only come into view on reel 1. Keep in mind that both the bonus and wild symbols award no specific pay-outs during your spinning sessions. The Free Spins Bonus will be launched when a wild symbol crops up on reels 2 or 4 and when a Bonus symbol makes an appearance on reel 1. You’ll be awarded 7 free spins! As you spin the reels, the positions that contain the wilds when the bonus is activated will remain wild as long as the bonus is triggered. No Bonus symbols are available when the Free Spins Bonus is activated on Sticky Bandits Slot. Now, any wilds that lands while the Free Spins Bonus is activated will stay on the reels until the bonus comes to an end. There are a huge number of online slots that come with the AutoPlay feature. This feature can come quite handy sometimes, especially for multitasking. 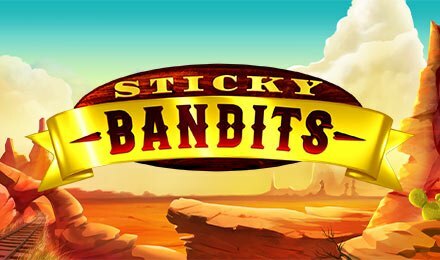 On Sticky Bandits Slot you can select several spins that will automatically play. It includes the following number of plays: 10, 25, 50, 75, 100, 500 and 100.